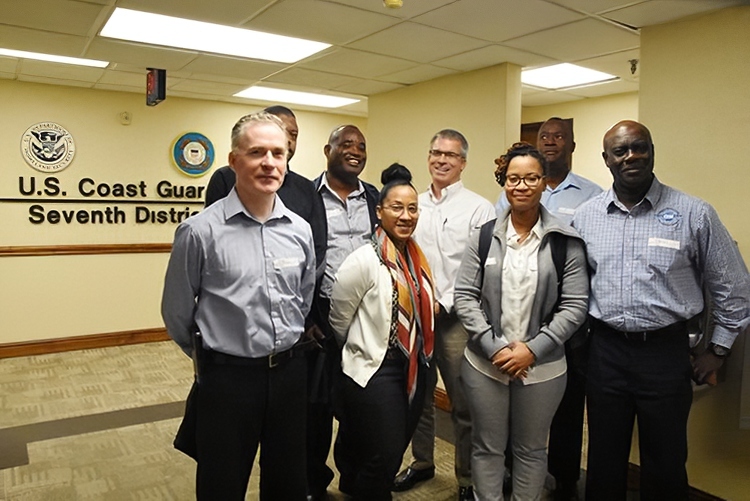 Representatives from local stakeholder agencies attended a Mass Rescue Operations workshop in Miami recently with “representation by Bermuda Maritime Operations Centre, Airport Operations, Disaster Risk Reduction & Mitigation Team, and Bermuda Shipping & Maritime Authority / Triple I coordinator, allowing better planning for any Mass Rescue Event”, according to a Bermuda Maritime Operations Centre spokesperson. A report from Red Ensign Group said, “Expertise from across the world of search and rescue is being shared as part of a commitment to building capability for Overseas Territories” in a workshop being held this week. “The workshop is being run by the Maritime & Coastguard Agency [MCA] as part of its Overseas Territories Search and Rescue [OTSAR] project through the Conflict, Stability and Security Fund [CSSF] which is funded by the UK Government. “It includes representatives from Anguilla, Bermuda, Cayman, British Virgin Islands, Montserrat and Turks & Caicos Islands. “Phil Bostock and Rob Priestley, from HM Coastguard, the search and rescue arm of the MCA, who oversee the OTSAR project, are leading the event.